Behind our new name lies a combination of 160 years of expertise, cutting-edge financial technology and a global footprint that reaches 190 countries, propelled by a world-class professional workforce. 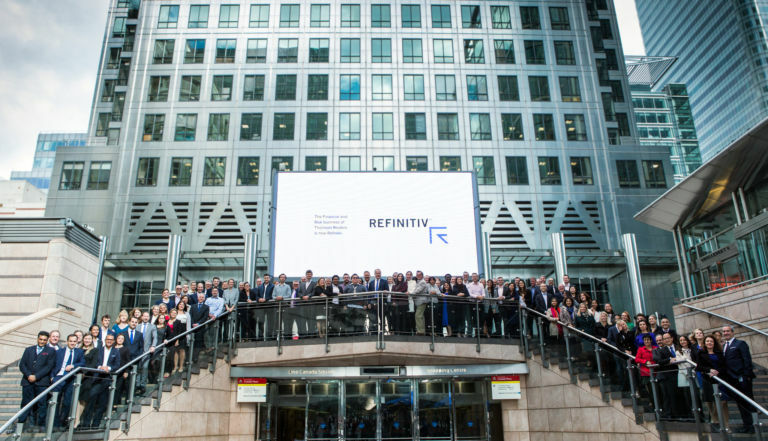 Announced earlier this year and officially launched on 1 October, Refinitiv is a world-leading provider of financial markets data and infrastructure, with a host of technology platforms, software and data and insights. 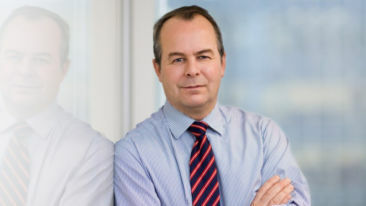 Built upon the shoulders of the former Financial and Risk business of Thomson Reuters, Refinitiv is the result of a strategic partnership between Thomson Reuters and Blackstone, a leading private equity funds management organization. 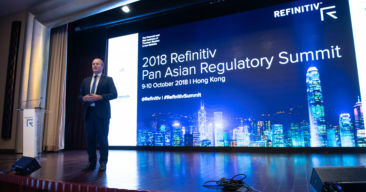 “At Refinitiv, we firmly believe in the power of financial markets to drive progress, and we believe in our role at the heart of that progress – empowering smarter and more sustainable investment, upholding fair, transparent and efficient markets, and finding better ways for our customers to prevent financial crime”, said CEO David Craig while sharing his vision for Refinitiv. 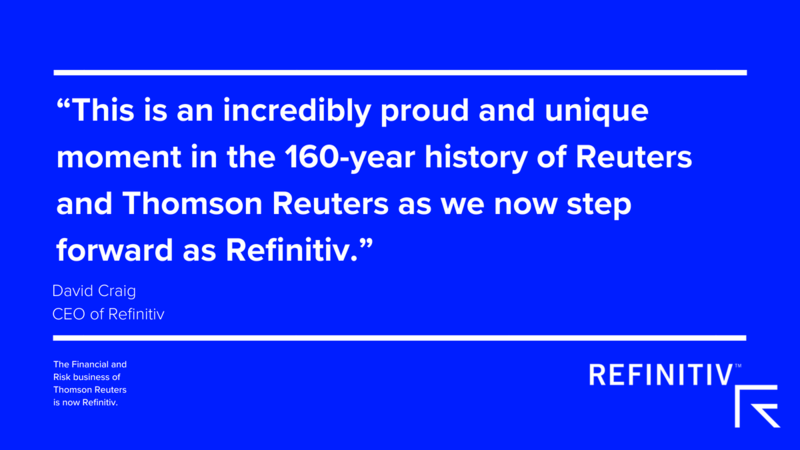 The name Refinitiv nods to our Reuters heritage, while declaring us the definitive leaders in connecting the world’s financial markets. 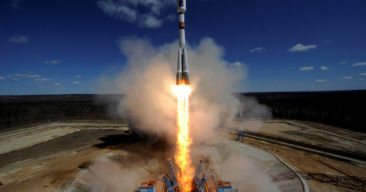 While the name may be new, the impact of our organization on the industry is well established – trusted by over 400,000 professionals in 40,000 firms globally, we help empower hundreds of billions of dollars in trading with up to 7 million updates per second delivered by data feeds for over 70 million instruments. 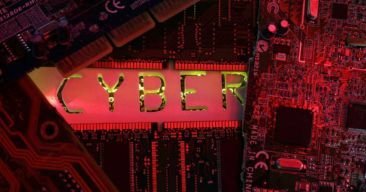 We provide the global professional FX community with unparalleled access to liquidity and support the battle against financial crime with 32,000 risk intelligence records created every month. With over 13,000 registered developers on our platforms and 2000+ active partnerships, our open platform fosters innovation and brings together expertise. With an open ecosystem and a focus on high performance, Refinitiv is committed to advancing together with our customers, colleagues, and partners to shape the industry towards progress. 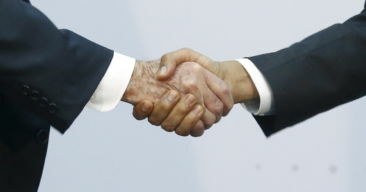 “This is the fintech deal of the first decades of this century! It will be viewed as a defining moment in the transition to the new 21st-century model for capital markets, with data at the centre. Refinitiv holds the cross-asset components that define much of the front office in equity, FX and Fixed Income. In conjunction with Blackstone, the new firm will play a crucial part in the evolution of data, helping create new market structures and trading models that the data-defined capital markets will allow for the buy-side, sell-side, and all new market participants.” – Brad Bailey, Capital Markets Research Director, Celent. 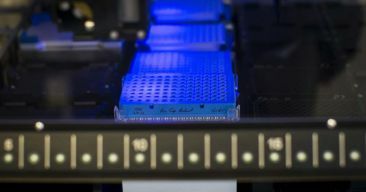 “As we reach a decade since both the merger of Thomson and Reuters and the financial crisis, Refinitiv is poised to move into growth mode. The infusion of Blackstone’s capital and management disciplines should help streamline the strategies and place significant bets in areas with high growth potential. 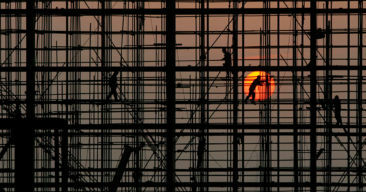 The structural upheavals unleashed on the financial industry by increased regulation and cost pressures, combined with disruptive FinTech innovation, mean there is an ever greater need for the financial community to leverage its data and tools to run their businesses more efficiently and uncover new commercial opportunities. 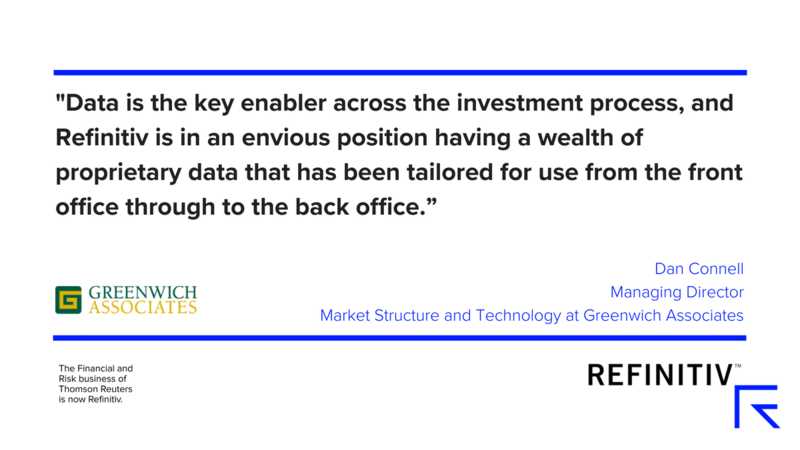 Data is the key enabler across the investment process and Refinitiv is in an envious position having a wealth of proprietary data that has been tailored for use from the front office through to the back office. Their investments in cloud, AI, and machine learning should all come together to provide a much faster growth trajectory.” – Dan Connell, Managing Director, Market Structure and Technology, Greenwich Associates. “Consolidation is changing the financial data marketplace as rivals seek to build holistic businesses that can service customers’ full data needs on a global scale. Refinitiv has the scale and renewed focus on its financial services heartland thanks to this deal. It will be a formidable force to watch as automation continues to reshape the industry and human roles evolve.” – Sang Lee, Managing Partner, Aite Group. “As the pace of innovation accelerates in the financial sector thanks to the cloud, AI and blockchain, partnership and collaboration will become ever more important to succeed. 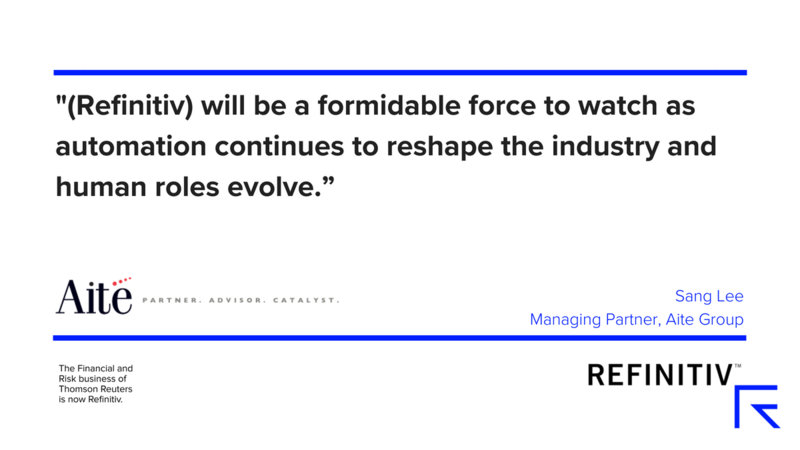 Refinitiv will thrive in this environment as it leverages the core strength of its industry-leading content, its open technology stack and its deeply rooted culture of partnership to provide a foundation for the financial community to build the business models of the future.” – Octavio Marenzi, CEO and Founder, Opimas. “When it comes to innovation, there is no better time than now to leverage Blackstone’s resources. Artificial intelligence (AI), data analytics, and blockchain-based smart contracts have huge potential in all the markets that Refinitiv serves.” – Will Jan, Vice President and Lead Analyst, Outsell. 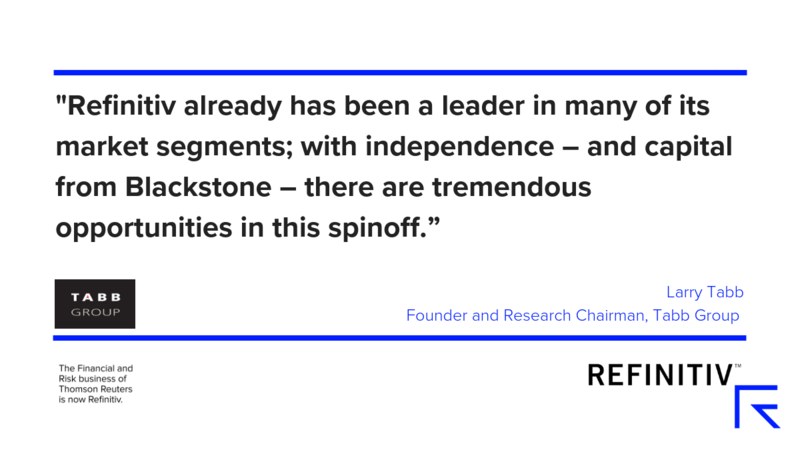 “Refinitiv already has been a leader in many of its market segments; with independence – and capital from Blackstone – there are tremendous opportunities in this spinoff. While the assets of Refinitiv are robust and extensive, there is much more that can be done to extend, reposition and better monetize these assets outside of the quarterly pressures on a public company. Blackstone’s patient capital model and deep understanding of Refinitiv’s business will be valuable in accelerating Refinitiv’s growth – indeed, the company has returned to growth this financial year with 3% organic growth in H1.” – Larry Tabb, Founder and Research Chairman, Tabb Group. To further explore all things Refinitiv, visit us at refinitiv.com. We also encourage you to join our community on Twitter and LinkedIn and participate in the conversation: #Refinitiv.